Since becoming a mature student, I spend more time in front of my lap top. Generally I use my laptop either on my sofa or in bed. As warm and cosy as this sounds it means that I do not have a set place that I sit down and work from, which means I have coursework all over the place and now I don't have any where I can just sit down and relax. After spending hours on my beloved Pinterest adding to my office inspiration board, I decided to make a little home office area.I don't think you need a whole room. Just a nice area where you can focus and be proactive without being distracted. 1. Invest in some good lighting, is your lighting too dim or too bright? Having good lighting is really important. 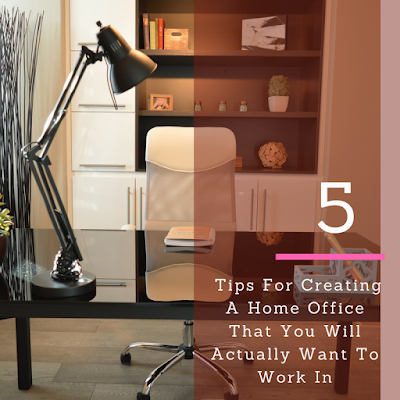 If your office area does not have a lot of natural light, which is especially hard in the winter months you will need to get some artificial lighting. This will stop you straining your eyes and help you work for longer. 2. Use the ergonomic rules, the top of your computer / laptop screen should be at eye level or a tad below. Your keyboard needs position so your forearms are parallel to the floor. 3. Pick a good chair, you spend most of your time sitting whilst working. So it is really important to have supportive seating. Having a bad back will cut your work productively, your mood and ultimately affect your health. Furniture at Home have a fab ebook, with even more tips and pictures. So go have a look and great inspired for an amazing home office for 2017!